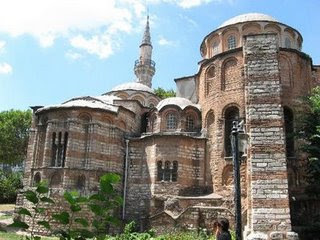 The word "Chora" "the countryside" outside the walls of the church because of the original Greek means. First form of the original church and no existing structures are the ruins left behind is based on 11C. Doukaina Maria Church, was founded by mother-Alexius I Comnenos laws between 1077-1081. Today the church two centuries later, super walls decorated with mosaics and frescoes revetted have a good pareclession were added. As a prime minister of the church founder Metochites Theodore Palaeologus I. EmperorAndronicus Also an astronomer, poet, theologian and philosopher, was the longer service. In fact, he lived a very painful life, and then emperor Palaeologus another place, he was sent exie. Then Konstantinople came back, he devoted himself to the church as a priest and died there. Atik Ali Pasha by the 16C to the early church has been converted into a mosque and the mosaics were covered with plaster. In 1948, it was restored by the Byzantine Institute of America in 1958 was opened as a museum. Nave (1) Koimesis, Virgin and Dormition. Paradise, for the last sleep before rising. Holding a baby Jesus is the symbol of Mary's soul (2) Jesus Christ (3) Virgin Mary. Inner Narthex (4) Christ enthroned and Bağış, with Theodore Metochites to provide a model of the church; (5) St Peter (6) St Paul (7) Deesis, Jesus and the Virgin Mary St (without John the Baptist) with the following two donors ( 8) Genealogy Jesus (9) Religious and noble ancestors of Jesus. The first three bays of the narthex mosaics inside Virgin's birth and life with an account. Some of them are: (10) Joachim's bid denied (11) St Anne, an angel God, pray for a child of his mother had accepted a report Annunciation (12) Joachim and Anne Meeting (13) Virgin Birth of Mary (14) Virgin first seven step (15) Virgin family affection given by (16) The Virgin and blessed by the priest (17) Virgin presentation in the Temple (18) Virgin receiving bread from an Angel (19) The Virgin receiving purple, such as wool and half-orders of the officers have decision for the Temple Maidens weave curtains (20) Zacharias, prayer time, the Virgin, High Priest Zacharias married for all the time to widowers and the name on the altar rods placed a sign that should be given to whom the prayer is not showing, had (21) The Virgin Joseph trusts (22) Joseph into his house as a virgin (23) for the good at Annunciation Virgin (24) Joseph leaving the Virgin, Joseph left for work for six months and that Virgin was pregnant and returned that there was suspicious. Here, a chronological resume is not it: (42-44) Miracles. Outer Narthex (25) Joseph's dream and journey to Bethlehem; (26) for the taxation record (27) Christ's birth, the birth of Jesus (28) Journey to the Magi, and (29) Claims and King Herod (30) Flight Egypt as ( 31-32) by King Herod massacres (33) Mother's and children's age (34) Elizabeth, St John the Baptist's mother and Flight (35) Joseph dream, return to the sacred family until Egypt Nazareth (36) Christ to Jerusalem for passover from (37) St John the Baptist bearing witness Christ (38) Miracle (39-41) Miracles. (45) Jesus (46) The Virgin and the angels pray. Parecclesion; Pictures here are frescoes. This church was designed to be a grave. This follows the frescoes is the largest parecclesion: (47) Anastasis, Resurrection. God, that had just broken the gates of hell, and Adam and Eve out of the stands trying pull their graves. The man behind the St John the Baptist, David and Solomon stand. There are other good king; (48) and Jesus, the last decision the next second. Enthroned Christ and the Virgin Mary and St John the Baptist (this trio is also Deesis) on both sides (49) The Virgin and Child (50) Heavenly Court angels (51-52) Moses.